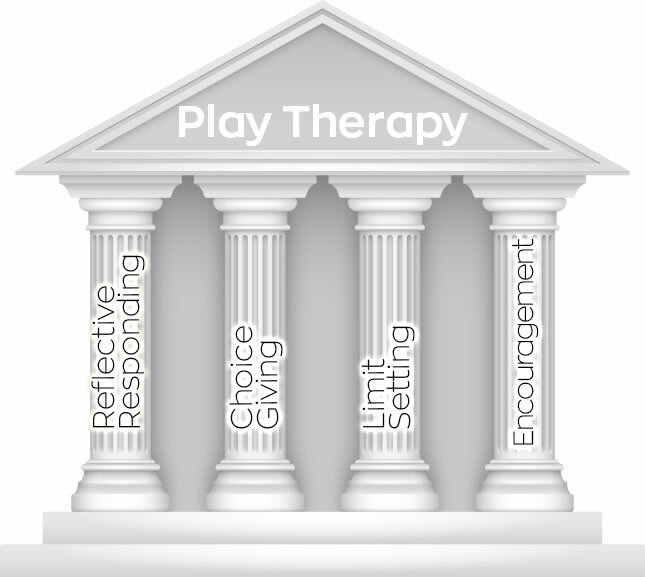 The four “Pillars” of Play Therapy are the foundational skills that Play Therapy is built on. Dr. Brenna Hicks gives an overview and examples for each of these skills. This video is foundational training for any parent looking to add Play Therapy skills to their parenting “tool box”. Hi, I’m Dr Brenna Hicks, founder of The Kid Counselor and Play Therapy Parenting. Today, I want to spend a little bit of time going back to some foundational play therapy principles. They’re what I call the Play Therapy “Pillars” and I realized that I talk a lot about these four principles and skills but have never really provided you with a framework in which to understand why they are effective and how to use them and integrate them together. So today I wanted to spend some time going through each of those four principles and helping you have a better understanding at a basic level of why they’re helpful and how you can use them with your own children. So the first Play Therapy Pillar is reflecting feelings. We start there because the reflecting feelings skill is the foundational skill on which some of the others are built. And if you think about the function of a pillar on a building or a structure, you know, typically they’re on older buildings and they serve as a supportive and foundational instructural purpose. Yet, they also hold things up and when I think about parenting and when I think about using play therapy skills with children, if you have the foundation and you have the structure and you have the ability to hold up your parenting, meaning you feel confident in it, you know how to handle things, you can always fall back on these principles and know that they will catch you and carry you through those difficult moments with your children. That’s the way I’d like you to think about these skills, so reflecting feelings is probably if I had to give you a size reference, I think the reflecting feelings pillars, probably the biggest because some of the later skills that I’ll share with you come back to you that skill. So essentially when you reflect feelings with your kids, the intention is you help them to hear the emotions that they are expressing. The easiest thing to do is start with “you”, use the feeling word that they’re expressing, so what’s their emotion, and then explain the scenario in short detail. If you feel that that’s helpful, so what that might look like is “you’re really excited about grandma coming over” so you, feeling word, is excited and then the explanation or the qualifier as it’s sometimes called is that grandma’s coming over and that is what’s making your child excited. For a negative emotion, It might be “you’re really angry that bobby’s stole your truck”. So “you”, feeling word was angry, explanation or qualifier was that bobby took the truck. Notice in both of scenarios my tone of voice and my facial expression shifted to reflect and mirror what the emotion that I was talking about was so it’s difficult for a child to feel heard and understood. If you say a happy feeling with a negative tone of voice or facial expression and vice versa. So you always want those to be congruent, that your face facial expression and your tone of voice match what the emotions. Click the following link for additional training about Reflecting Feelings. So that is your foundational skill. If you are able to acknowledge and validate your child’s feelings, first you need to recognize what they are, and sometimes children are more nonverbal than they are verbal. So sometimes the challenge is even identifying what they are truly feeling, but once you are able to fully understand your child’s feelings and then share that back with them, that helps them feel that you understand, you can relate and that no matter what they’re feeling, it’s OK. So the second “Pillar” is Choice Giving. Now Choice Giving provides children with an opportunity to not only develop problem solving and decision making skills, but it also helps to empower them and to give them the opportunity to take responsibility for the outcome of their decisions. 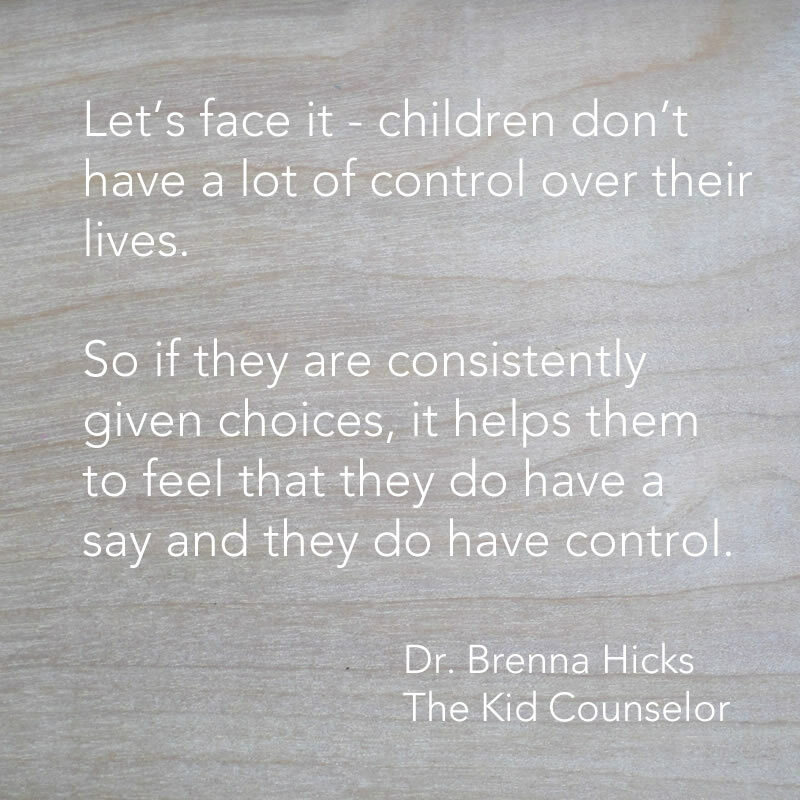 There are several different ways that you can offer choices, but the most basic choice is an empowerment choice where you provide options for the child to choose from and you’re OK with either option and it is merely for the sake of empowering the child to feel a measure of control. Why choices are so effective is because it gives the child a measure of control and power in an appropriate instance so that they will not buy for that control and power all the time. Because let’s face it, children don’t have a lot of control over their lives. And so if they are consistently given choices, it helps them to feel that they do have a say and they do have control. And in those empowerment choice moments, it really doesn’t matter to you either way. Obviously the intention is that there’s going to be a vegetable at dinner. You’ve already made that decision as the parent, so then your choice comes out of the parameters you’ve already set and therefore the child is given a measure of control within your greater control. So again, you wouldn’t care one way or the other what vegetable was selected, but the child says, oh, I get to make the decision and I feel good about the power that mom or dad extended to me. And the more of those experiences take place, the less they try to power struggle and fight for control in other situations. Another example might be “you can choose to have an apple in your lunch or mandarin oranges in your lunch today, which do you choose?” Again, a choice for the sake of giving a choice and it helps the child to not only understand that they have to accept the consequences of their choice, but it also helps them to build their decision making skills and also buy into the choice that was made because they’re much more likely to eat the green beans at dinner if they chose green beans and carrots rather than you just put in green beans on their plate and them saying, “I didn’t want green beans tonight”, or “I don’t like green beans”. Once they’ve already made that choice, they are much more likely to abide by the choice because they have buy in over that decision. So first Play Therapy Pillar, Reflecting Feelings. Second, Play Therapy Pillar, Choice Giving. Third Play Therapy Pillar is Limit Setting. This is the one that parents typically want me to go into first because this is for discipline sake, but you’ll notice that it uses the reflecting feeling and choice giving skills, and so it has to come after those two. So limit setting is another model. Just like reflecting feelings is “you”, feeling word, explanation. Choice Giving is “you can choose this or you can choose this, which do you choose?” Limit Setting combines all of those. So it’s acknowledged the feeling, reflect what the child is expressing, setting the limit the behavior, whatever the behavior is, that’s not acceptable. You set a limit on that behavior and then you offer an alternative so that they can express the original feeling, but in an appropriate behavioral way. So let me share some examples for that. So if your child is yelling and the rule in the home is that we don’t yell, then you can say, “Susan…” I didn’t mention this, but it’s helpful to use the child’s name because it’s very clear that you’re spending time to talk to them about something. So “Susan, I know that you’re upset right now.” There’s the reflection of feeling if the child’s yelling and it’s not just a happy, excited, yell. I mean if they’re angrily yelling, then you acknowledge they’re upset. So “Susan, I know that you’re upset right now”. Then you set the limit, “but the house is not for yelling in”. Notice how it’s a neutral and calm limit. It’s not as effective… Actually, It’s not effective at all if you say, “I told you to stop yelling because” then you become the dictator that’s insisting upon obedience rather than a neutral limit that does not yield as much resistance and argument. So “the house is not for yelling in”. It’s neutral, it’s calm, and it can be said very calmly and in control. Just as if you would say “the grass is green outside”. “The house is not for yelling in”. So acknowledge the feeling. You’re reflecting what the child is expressing. Then you’re setting the limit. “The house is not for yelling in”. That’s the behavior that you do not think is acceptable, and then you offer an alternative. So if the child is angry and they need an outlet for the anger, you could say “you can choose to go outside and yell”, if you’re OK with that, just as the choices that you offer you were OK with either one. You were OK with carrots or green beans. You were OK with me and or an orange or an apple. You will be OK with the alternative that you’re offering as well, so “you can choose to go outside and yell, or you can choose to hit your pillow on your bed until you no longer feeling angry.” So in both alternatives. You as the parent would be OK with either of those choices. If for you specifically, those would not be agreeable choices to you, then you could come up with two different choices that would allow Susan to express the anger or the frustration, but do it in a way that still abides by the household rules. Another limit might look like “Jack, I know that your sister just took the toy from you, but your sister is not for pushing. You can choose to come tell me that she took the toy or you can choose to ask for her to give it back”. So Jack was frustrated because something happened that didn’t seem fair. So you acknowledge that. Then the limit is though, that kids aren’t for pushing. People aren’t for pushing. Your sister isn’t for pushing. So then you’re acknowledging the behavior that you would like to have changed and then you’re offering another alternative. So in that scenario you would be OK with him coming to tell you or asking for the toy to be returned. So there’s your third Pillar of Limit Setting and then the final one, fourth Pillar of Play Therapy is Encouragement. Encouragement is not specifically related to the other three, but it does some of the same things. And so just like choice giving builds confidence and builds decision making and helps them feel empowered and reflecting feelings helps them feel understood. Encouragement does those, but in a little bit different way. 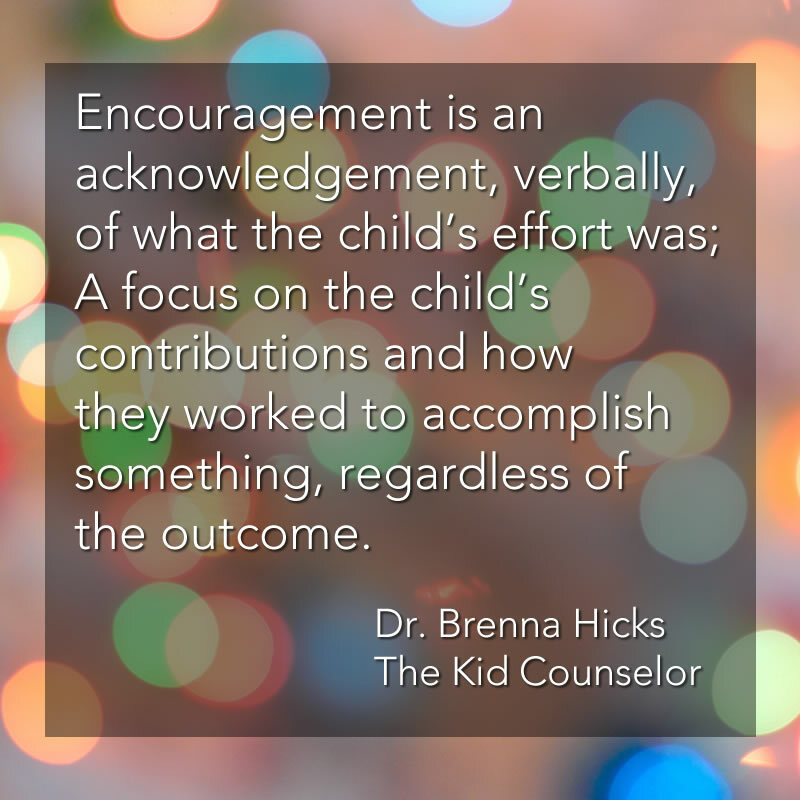 So encouragement is an acknowledgement verbally of what the child’s effort was, what the child’s work that was contributed is how they worked to accomplish something regardless of the outcome. And what’s interesting is we often praise our children and especially in the academic setting and in extra curricular settings, sports, things like that. There is almost always exclusively praise that’s offered, but praise always has a value judgment attached. So the child does something and the automatic response is “good job”. “That was awesome”. I’m really struggling to even think of praise phrases because I don’t say them. “That was awesome”. “Great job”. “Your picture was so pretty, I love it”. “I’m so proud of you”. All of those have a value judgment specifically related to what I think about what happened. So “I think your pictures pretty”. “I think you did a good job”. “I am proud of you”. “I think that was amazing” and they are almost always outcome based, whereas encouragement does not have value judgments and it is effort based so it can always be given regardless of the outcome. So even if a child comes in last place in a race or performs poorly on a test or does not win the spelling bee or struggles at sports and is not scoring goals or making points or whatever, those are all opportunities where encouragement can be given. So let me share some examples of what Encouragement would sound like. It focuses on what the child did. So just like with Reflecting Feelings, you will start with “you”, and then acknowledge what effort was put forth. So “you worked hard”, “you kept trying”, “you didn’t give up”. “You figured it out”, “you got it”, “you worked until you were able to accomplish that”. “You know a lot about that”. So notice how it’s not at all related to the outcome, but it is related to the qualities that the child possesses and the work that the child put forth. 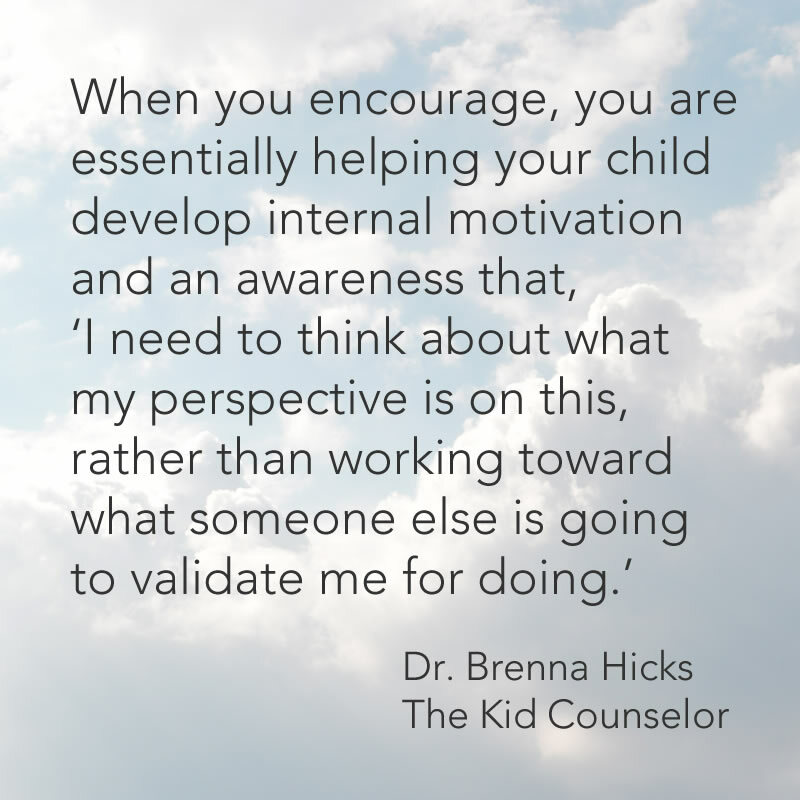 So when you are encouraging, you are essentially helping your child develop internal motivation and an awareness that I need to think about what my perspective is on this rather than working toward what someone else is going to validate me for doing. Let me say that in a different way. Oftentimes when kids have been praised, they learned the message that I do things so that other people will validate me. I do this and say, “isn’t this pretty mommy?” “Don’t you like this daddy?” “Didn’t I do a good job?” “Are you proud of me?” “Do you love it?” “Isn’t it great?” where they are constantly performing for the reaction, rather than I’m really proud of how this turned out. I worked really hard. I put forth a lot of effort. I didn’t give up even when it was challenging. I’m proud of that. I feel good because I did this, so notice that it shifts to an internal awareness of what happened rather than looking for external validation and acknowledgement. So those are the four Play Therapy Pillars. Those are the four most foundational and basic skills from the Play Therapy perspective and now that I’ve covered them in a basic level, I hope that you start to feel more comfortable thinking through them and using them and being aware of the impact and the significance of those skills. When you’re interacting with your kids. Make sure that you sign up for my newsletter, that you like me on facebook, and that you subscribe to my podcast on Itunes so that you will always have more tips, more information, and more parenting skills at your disposal. I look forward to seeing you again soon. Thanks for watching. Bye.